Chef at the Market & Acoustic Jam – Last ones for the season! Just 4 more markets left this season! Join us today from 3:30pm to 6:30pm (Fall hours) for our last Chef at the Market and Acoustic Jam pairing. This month Chef Plemmons will be cooking up an amazing dish with market fresh ingredients. Chef demos are at 5pm and 6pm under the Chef at the Market tent. Don’t miss out on the fun and good food! Acoustic Jam takes place under the Music at the Market tent from 3:30pm to 6:30pm. Bring yourself, an instrument, and even a friend, and join in on the community jam session. Don’t forget you can also use your EBT card at the market booth. For every $5 taken out EBT card users will get an additional $2 in Fresh Bucks good towards even more fresh fruits and veggies from our farmers. Get your farmers market fix while you can today at Evergreen Park! Handy Andy Magic Man – Balloon artist for kids and adults! CJ’s Evergreen General Store & Catering – Serving BBQ, burgers (veggie & meat), hot dogs, pies, and other rotating specials. Wokcraft – Asian infused dishes including lumpia, ramen, stir fry and more! Crusty Crumbz on Seaview – Baked cakes, cookies, cupcakes, pies, dessert squares, brownies and much, much more! Heaven’s Kettle Corn – Pulled Pork sandwiches, shaved ice cones, and unique flavored kettle corn. Laughing Dog Kitchen – Vegan & Gluten free baked goods! Jacquelyn Speare – Last week at market! Leave a comment Chef at the Market & Acoustic Jam – Last ones for the season! Fall Hours – Start Sept. 20th! 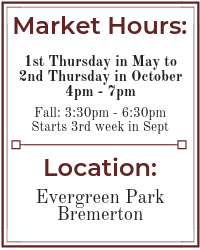 With early sunsets upon us, the market is moving to our Fall hours starting Thursday, September 20th. We will have all the same great vendors options for you, just a half hour earlier! Stop by and see us this coming week and shop local! Leave a comment Fall Hours – Start Sept. 20th! We have a TON of fun stuff planned for you today, Sept. 13th, as part of our annual Healthy Communities Day event. We will be spotlighting some of the great organizations in our community that help us live happy, healthier lives. Plus we will have fun kid and family activities for you to take part in including games, giveaways, kids crafts and more. Swing into the market anytime between 4pm & 7pm to celebrate with us! Holly Ridge Center – Healthy Communities Day Sponsor! Kaiser Permanente of Washington – fun freebies and information for the whole family! Kitsap County Substance Abuse Prevention – coloring books, education materials, chalk art! 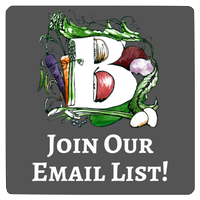 Bremerton Foodline – information, games and small giveaways! Lutheran Community Services NW Military Response Program – They will have a fun hands on craft project for the family! Tracyton Community Library – providing crafts for kids! Handy Andy Magic Man – Balloon fun! Krys Kreations Face Painting & Parties – Face painting for all ages! Leave a comment Healthy Communities Day! Come to market today from 4pm to 7pm for the Kids Tomato Taste Off! Bring your little ones (3 yrs to 13 yrs) to come taste some of the delicious varieties of tomatoes our farmers have to offer as part of this month’s Kids Market Bucks Club. They will taste and rate their favorite varieties and their vote will determine the ultimate tomato winner. As always, you can get more with your EBT at market through our Fresh Bucks program. For every $5 you take out on your EBT card you get an additional $2 in Fresh Bucks to spend on even more fresh produce at our farm vendors. It is going to be an amazing market – Join us! Leave a comment Kids Tomato Taste Off! Join us today from 4pm to 7pm down at Evergreen Park for the Bremerton Farmers Market! In addition to our amazing artisan vendors and delicious hot food offerings, our producers will be bringing farm fresh produce (including berries! ), cut flowers, 100% grass-fed beef products, duck eggs, Certified Organic chicken, and much, much more! It is going to be an amazing Thursday – Join us! Roots Farm – Bringing squash blossoms! Yoga at the Market – August 23rd! Join us today for our monthly Yoga at the Market event, brought to you by The Movement Studio at Chiropractic Lifestyle Center. This is a fun, FREE, all ages / all levels yoga session starting at 5:45pm in the open grass area behind the market vendor booths. Make sure to swing in beforehand to pick up your weekly groceries from our amazing farmers and then stick around after Yoga and grab a bite to eat for dinner from one of our hot food vendors. – Handy Andy Magic Man – Balloons! Shorts Family Farm – It’s time to start making bone broth 10% off soup bones and meaty neck bones! Leave a comment Yoga at the Market – August 23rd! Community Music & Culinary Delights! Join us today from 4pm to 7pm for another amazing day at market! It is our monthly Chef at the Market food demonstrations sponsored by our friends at Peninsula Community Health Services. This month we have Chef Chris Nau joining us. He will be cooking some amazing dishes that you can easily reproduce at home using our very own market ingredients. Demos are at 5pm and 6pm under the Chef at the Market tent. Make sure to stick around after the demo to taste what Chef Nau has created! Also at market today is our monthly Acoustic Jam session set under the Music at the Market tent, generously sponsored this season by Kitsap Credit Union. Stop by with your instrument and a friend anytime from 4pm to 7pm and join in to create some amazing community tunes! We hope to see you at the market! Leave a comment Community Music & Culinary Delights! Check Out What Is Happening At Market!